This Saturday is Mulch Day at the NatureSpace! Now that the fence is in, we need to spread mulch over the site to smother out grass and weeds and prepare the soil for Planting Day on November 10. Tell everyone you know — whatever their age or ability, there will be something do do. Parents with little ones are especially encouraged to come, as it’s never too early to provide children with an opportunity to serve in their community. Also, playing with mulch using toy buckets and shovels is really, really fun. Even if your family can only stay a little while, the Friends of Wilshire Park will be very happy to have you. We will get started at 8 a.m. and likely finish up around noon, depending on the number of volunteers that show up. Bring a picnic lunch, as we’ll all eat together at about noon. All volunteers must wear gloves, and please bring buckets, shovels, hard-tined rakes, and wheelbarrows to help distribute the mulch over the site. Please do not forget to sign up on our official volunteer form so that you can be counted and receive up to date information. All volunteer hours can be used for scouts, school, or other official programs. We have another volunteer opportunity coming up next weekend — repainting the lettering on the sign posts around the dog park. The words on the posts are pretty much illegible, which isn’t helpful as we want dog owners to know the boundaries of the off leash area as well as provide a reminder that dogs should never be off leash elsewhere in the park. One of the top complaints at early meetings of Friends of Wilshire Park is that many dog owners fail to keep their dogs on leash, and when dogs bolt through the children’s play area they frighten little children or even knock them down. Additionally, many older children and adults are not comfortable around unleashed dogs, so repainting the sign posts will help remind dog owners to have good park etiquette. We will paint the signposts on Saturday, October 13 at 9 am, staying as long as we need to. If we are rained out, we will try again on Saturday, October 20. Volunteers should bring old kitchen dish brushes to clean out the recessed lettering and small craft paintbrushes if they have them. Paint will be provided. If you wish to help repaint the signposts, please send an e-mail to [email protected]. 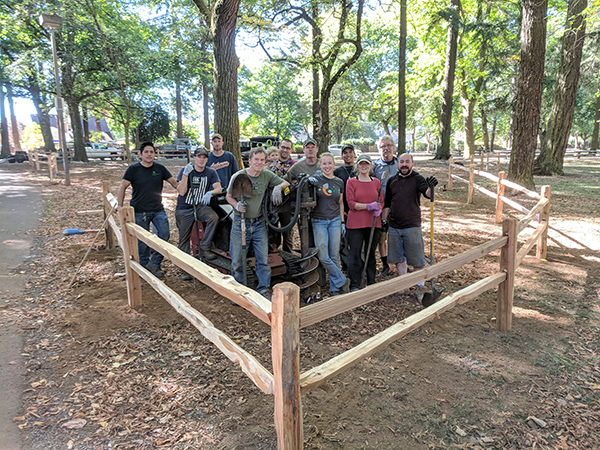 On Wednesday, September 26, six Friends of Wilshire Park and a team of employees from Portland Parks and Recreation installed a new split-rail fence to enclose the new NatureSpace. We had absolutely perfect weather — not too hot, so we only got extremely dirty instead of extremely dirty and extremely sweaty. 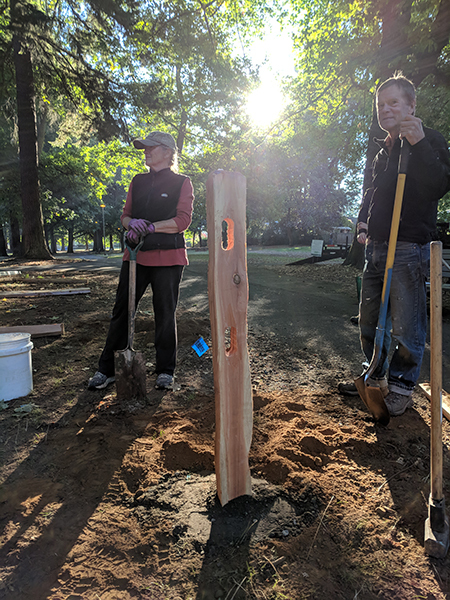 The Friends wish to thank everyone from Portland Parks and Recreation, who worked just as hard as the volunteers, for helping us realize our very first big project. The NatureSpace site before: just some dirt, leaves, and a big ol’ pile of gravel. The first fence post is in! Now just about a hundred more to go. 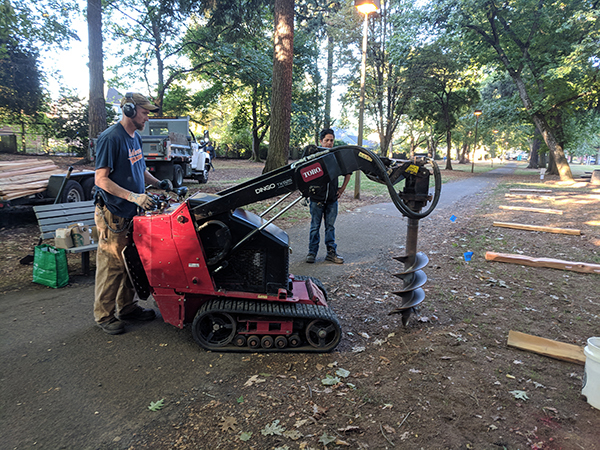 We were happy that Portland Parks and Recreation brought in an auger, especially once we realized just how compacted the heavy clay soil was. Making progress, one rail at a time . . . The team hits the home stretch, motivated by civic mindedness . . . and the fact that pizza is on the way. Success! All ready for Mulch Day on October 6 and Planting Day on November 10. We’ll see you at the park! Author Friends of Wilshire ParkPosted on September 29, 2018 September 29, 2018 Categories ServiceTags NatureSpace, success, volunteers1 Comment on The Fence is Up! This is an exciting week for Wilshire Park. The city will begin installing a new piece of toddler play equipment thanks to some funds from the voter-supported Parks Replacement Bond. The largest play structure in the toddler area will be removed and replaced with a new, safer play piece along with new poured-in place safety surfacing. Work will take about three weeks, and details can be found here: portlandoregon.gov/parks/76593. Please remember to use our official signup form, located at the bottom of that post. It’s the only way we will know you are confirmed to volunteer and all official instructions, including how to get credit for community service, will only be sent to those who have signed up. On September 19, 2018, the leaders of various Friends of Wilshire Park teams met to prepare for the installation of the NatureSpace and plan for future projects. Volunteer recruitment for the three NatureSpace dates (26 September, 6 October, and 10 November) is going well and at this point there are sufficient volunteers to get the job done, although there is room for more people to join in, so recruitment should continue to allow as many community members who can to contribute to this project. Sign post repainting for the off-leash dog park will take place on Saturday, October 13. If the weather is too rainy that day, then this will be bumped to Saturday, October 20. Any interested volunteers should arrive at the park at 9 a.m. and bring any craft brushes, plastic dish brushes, and paper towels that they are willing to contribute. The dish brushes will be used to gently clean out the recessed lettering, which will be repainted with small craft brushes. The bulk of the discussion focused on how to begin fundraising to replace all of the broken equipment in the children’s play area. 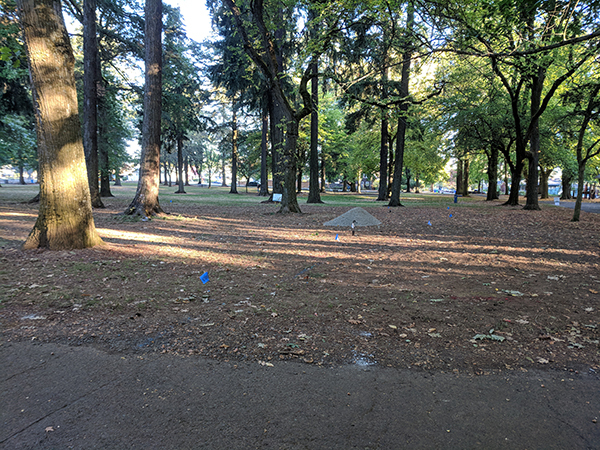 Portland Parks and Recreation allocated a little bit of bond money to replace the largest of the pieces, with work to begin any day now. This will provide a badly needed replacement so that babies and toddlers will have somewhere to play for the time being, but more work must be done to replace the other splintered and rotting pieces. The leadership team went through a list of questions given to us by city representatives, which encouraged decisions on which fiscal sponsor to work with, what sort of fundraising efforts the Friends will engage in, and how to communicate with the public. This resulted in a to-do list that included reaching out to our preferred fiscal sponsor, writing op-eds for local newsletters and newspapers, applying for grant money, and recruiting committee members with experience and interest in this area. The PTAs of local schools seemed like a good place to start, and our goal is to have some PTA members attend our next meeting. The next meeting of Friends of Wilshire Park was set for October 17. The next meeting of Friends of Wilshire Park will take place on Wednesday, September 19, 2018, at 7:00 pm at Bethany Lutheran Church, which is located at 4330 NE 37th Avenue, just at the northeast corner of Wilshire Park. We’ll be discussing the planting schedule for the new NatureSpace as well as discussing how to organize our growing list of volunteers. We’ll also set a date for repainting the lettering on the signposts around the dog park and repairing the hutch that holds dog waste bags. This meeting will be very important for anyone interested in improving the children’s play area. Portland Parks and Recreation has come up with some bond money to replace one piece of the toddler equipment, but there are no funds to replace the remainder of the pieces, so it’s up to us to get the job done. We’ll be discussing fundraising efforts, setting a time frame for our efforts, and going over our range of options. Any Friends with experience in grant writing, fundraising, or just a passion for the idea that little children need good outdoor places to play is invited to join in the discussion. Get your buckets, shovels, and gloves! Whatever your age, ability, or knowledge of gardening, you are wanted and welcome. We have been particularly happy to see how many families want to get involved with their children, because it is their park too and it’s never too early to find ways for little ones to make a difference in their community. Here is the schedule for volunteers. 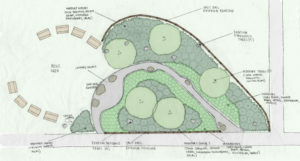 There will be other installation dates, such as when the site is marked out and when the gravel and boulders are installed, but these tasks will be done by Portland Parks and Recreation and Verde, an organization that helps to build native landscapes because they require special knowledge and equipment or just don’t really require volunteer work. Wednesday, September 26 from 7 AM to 2 PM: Let’s Build a Fence! We need 4 to 6 adult volunteers to assist Portland Parks and Recreation with the installation of a split-rail fence. Volunteers should bring their own gloves and a water bottle, dress for whatever weather Portland decides to throw at us that day, and either bring a bag lunch or a few bucks to pool for pizza delivery. Volunteers should be in good health and able to lift rails, dig with shovels, and move dirt and gravel. Saturday, October 6 from 8 AM to 12 PM: Mulch That Grass! This is the volunteer day that is particularly aimed at families who wish to involve their children. We need many people of all ages and abilities spread wood chips over the site. Every volunteer should dress for the weather that day, bring lunch and a water bottle, and wear gloves (even the little ones). Kids are encouraged to bring their toy buckets, shovels, trowels, and rakes. Older volunteers should bring hard-tined rakes, large buckets, and wheelbarrows to help move bark mulch and spread it to a depth of 3 or 4 inches to smother out the grass underneath the planting site. There will be a kids’ area set up in the pavilion for stroller parking, coloring, and diaper bags. Volunteers are encouraged to stay for a picnic at noon. In the event that the mulch hasn’t been fully spread by lunchtime, volunteers who can are asked to stay until the job is done. Volunteers with physical conditions that make it difficult for them to spread mulch are still needed to help with handing out coloring pages for kids, directing volunteers to the right place, and helping students and scouts with their paperwork confirming their volunteer hours. Saturday, November 10 from 8 AM until we are done: Planting Day! We’ll need plenty of volunteers of (most) ages and abilities needed to install native trees, shrubs, and plants. Volunteers should dress for the weather, wear gloves, and bring trowels, hand rakes, shovels, and other tools for planting items of various sizes. Those who participate in planting should be in good general health and be able to dig, lift plants of various sizes, carry them from a truck to their planting site, and lift bags of soil. There will be large and small plants, so we will match you with activities that fit your abilities. Volunteers who are unable to help with planting are still needed to help with paperwork and organizing volunteers. Children are encouraged to come, but parents should consider age and maturity before deciding to participate as we don’t want plants to be damaged during installation. Volunteers should bring a lunch or money to pool for pizza delivery. If you have questions, just drop us a line. Please sign up for our newsletter using the form to the right in order to stay up-to-date on volunteer opportunities and improvements being made to Wilshire Park. We look forward to seeing you on our volunteer days! Author Friends of Wilshire ParkPosted on September 5, 2018 October 5, 2018 Categories Announcements, ServiceTags building, families, kids, NatureSpace, planting, scouts, students, volunteers3 Comments on Get your buckets, shovels, and gloves! Tomorrow is the Beaumont-Wilshire Picnic at the park! Tomorrow, August 7, is National Night Out and the Beaumont-Wilshire Neighborhood Association will be hosting their picnic at Wilshire Park. Join your neighbors at 6:30 p.m for a pleasant evening at the park. BWNA is providing hot dogs, hamburgers, and veggie burgers as well as music and activities for children, and you’re encouraged to bring a side dish to share with your neighbors. This event will be a great chance for Friends of Wilshire Park to enjoy a pleasant evening with friends and family, so we hope to see you there! Author Friends of Wilshire ParkPosted on August 6, 2018 Categories EventsTags bwna, fun, picnicLeave a comment on Tomorrow is the Beaumont-Wilshire Picnic at the park! This morning two Friends of Wilshire Park headed to the north side of the dog park for an hour to rake out some of a new delivery of mulch. They put a pretty big dent in the pile, especially considering that one of the volunteers was only four years old! 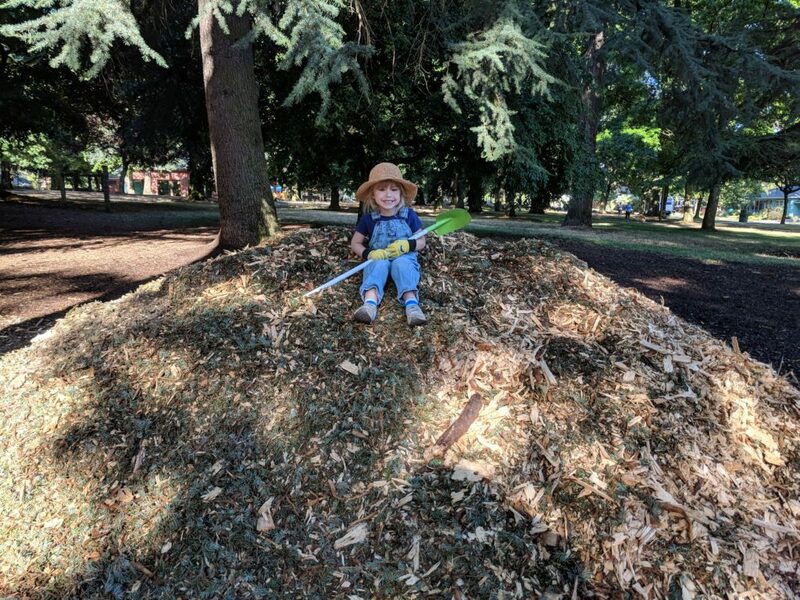 The volunteers will come back over the next week to keep spreading out the pile, but if any other Friends would like to help out, just grab a rake or shovel and head to the park! The mulch needs to be evenly spread out in the are where it was dumped, covering areas where last year’s mulch has worn thin. Any especially sharp pieces of wood can be tossed under the base of a tree to keep them from injuring the dogs’ paws. 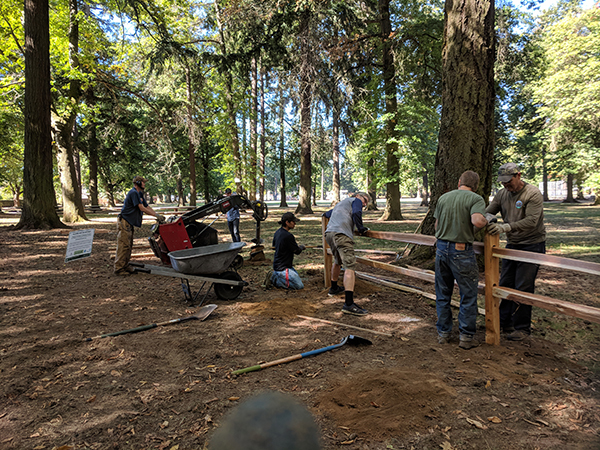 If you do help out, please leave a comment on this post telling us how many work hours you put in as Portland Parks and Recreation likes to track volunteer hours. Volunteer time can also be used toward community service projects for school or scouts, so students in need of a summer activity can help out! Just drop an e-mail to [email protected] for a verification form for your volunteer time. Our push for volunteers and donations for the NatureSpace is rolling out! We have secured a grant for about $10,000 from the Community Watershed Stewardship Program and have applied for more, but any extra donations that come in will mean more plants, shrubs, and trees for a vibrant, healthy habitat between the picnic area and the pavilion at Wilshire Park. 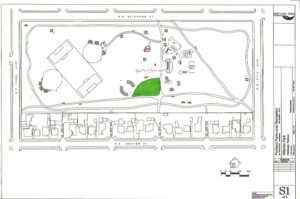 We also have a site plan. Check it out! 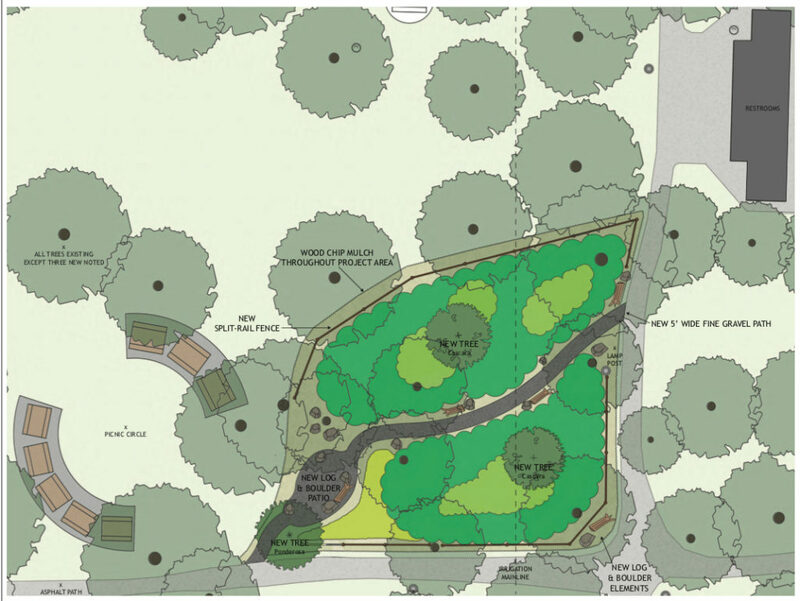 We’ve been working with members of Portland Parks and Recreation to develop this plan. Our hope is that the NatureSpace will serve many needs. It will help prevent runoff and erosion into storm drains, provide shelter and food for native and migrating birds, and give bird enthusiasts a great place to spot their favorite flying friends. As it’s adjacent to the picnic area, we know it will provide a pleasant place for children to explore or for families to sit and relax after a meal. We’ve also learned that students from Beaumont Middle School have surveyed the site with their science teachers, taking soil measurements and counting the number of plant and animal species they saw in the home of the future NatureSpace. An ongoing school science project will be to track the soil health and biodiversity of the site. This project is especially gratifying to the Friends of Wilshire Park, as it shows what a direct public benefit the NatureSpace will be. As Friends of Wilshire Park is a grassroots organization, we are not a 501(c)3 and cannot collect tax-deductible donations. To ensure that we are transparent about how we handle funds and meet every legal requirement for fundraising, we’ve partnered with the Central Northeast Neighbors Coalition, the umbrella group for our cluster of Portland neighborhoods here in Northeast. They’ll hold onto every tax-deductible donation that comes in for the NatureSpace, and donors will be able to see how every penny was spent. A crowdfunding effort will begin soon to augment the grant we’ve secured, which will mean more plants, a more lush space, and more happy people and animals at Wilshire Park. Our page at friendsofwilshirepark.org/volunteer will always have the latest information on what you can do to help make the park a nicer place for everyone. If you would like to be added to our mailing list for Wilshire Park Volunteers, please drop us a line at [email protected] We will never share your information with third parties and you will only receive information about volunteer projects at the park. You can also subscribe to our newsletter using the form in the column to the right on this page. This will allow you to get all of the news and announcements about upcoming projects, meetings, and events. Author Friends of Wilshire ParkPosted on August 4, 2018 Categories Announcements, ServiceTags fundraising, NatureSpace, volunteersLeave a comment on Volunteers needed! Nancy summarized current status of the project. The site plan is almost finalized. We have $9,128 in funds in hand thanks to the Community Watershed Stewardship Program grant. The total estimated project cost will be between $13,180 and $18,180, depending on how much additional fundraising happens. Barbara Linssen summarized the current status of work with our fiscal agent, Central Northeast Neighbors. We are awaiting final information about crowdsourcing funds and how to correctly handle donation checks. Checks should be made out to Central Northeast Neighbors with a memo noting that the funds are for the NatureSpace account. Barbara also noted that donations to the project will be tax deductible, and that accountability is required from organizations that issue grants, so we will need to report on how the money was spent and how many volunteer hours and hours of public engagement the project entailed. Tiffney Townsend reviewed the status of PR materials. She has completed flyers and small handouts summarizing the scope of the project with concept visuals and web addresses for more details. They will be posted at friendsofwilshirepark.org/resources the moment we get the go for fundraising. All of the PR materials can be downloaded and printed at home, or taken to a professional printer. Two versions are available including 8 1/2 by 11 posters suitable for hanging in shop windows and four-to-a-sheet small handouts that could be given to friends and neighbors. The question of how business donors would be recognized was raised. Peter was under the impression that parks would not allow signage of this type on Park property but Eric thought some sort of temporary short-term signage would be possible to acknowledge major donors. In either case, there could be recognition of business donors in the Beaumont-Wilshire and Alameda Neighborhood Newsletters which go to many neighborhood residents. Mary Jaron Kelly shared her experience with fundraising. She suggested the potential value of tabling at Fremont Fest on August 4 and offered to sign up volunteers and help Tiffney with PR materials. Eric Rosewall felt the budget range and flexibility was reasonable and that that supervision of volunteers would not be difficult since the tasks at hand were fairly straightforward. Eric said a preliminary schedule for work days – soil preparation, constructing hardscape and planting – would be available soon. 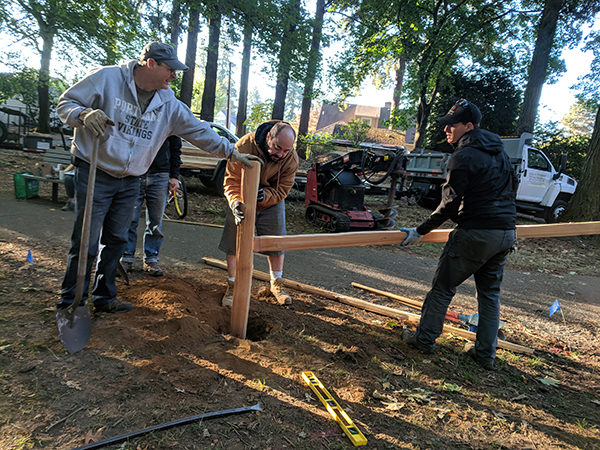 Eric noted that inkind donations (plants, hardscape materials, refreshments for work crews) could be accommodated but would need to be integrated with the work schedule. Eric also mentioned that the CWSP grant was dispersed on a reimbursement basis meaning that materials would need to be paid for out of a source other than grant money initially and then reimbursed by CWSP through the fiscal agent at a later date. Mary Collet said that it would be helpful if business donors could be offered the possibility of purchasing specific items. Eric responded that this might be difficult with regard to financial donations but that if a business wished to donate a product – for example a hardware store or feed store donating fencing or a nursery donating flats of native plants – this would be possible to accept and integrate into the work and accounting. Mary also reminded the group that some businesses had employee volunteer work programs and that this could be a source of some of the community volunteer labor. Fara Blazak has already spread the word to some of the leaders of local Girl Scout troops that they and their Scout troops could expect to participate in planting and other activties when they occur in the fall. She will also seek volunteer involvement from the Alameda Girl Scout troops. Everyone was asked to give some thought to businesses and individuals they might approach to donate towards the NatureSpace. One way of presenting this idea is that the project already has $9125 in grant support but needs matching funds of about this same amount to achieve its full potential. Members of the group listed prominent bankers, realtors, and other businesspeople who would have an interest in improving the neighborhood and may be willing to display our posters or even make a tax-deductible donation. There were two important concluding notes to everyone helping with the NatureSpace. First, do not begin asking for donations yet as there isn’t anywhere for the money to go and we don’t want enthusiasm to fizzle. As soon as we clarify the details of how we will work with out fiscal sponsor, the PR and informational materials will be released and you can go for it. Secondly, when you intend to contact a specific business, please let Peter know so we can avoid having multiple requests sent to the same business.